Network attached storage device manufacturer Synology had a great booth this year at CES. ThinkComputers’ Colin Dean talked with Synology’s Doug Self about the new version of the NAS firmware running on Synology devices. The new version includes some reorganization of the desktop-paradigm control panel and also enables a new CloudDrive feature, which enables a user to setup and control their own cloud storage system, like SpiderOak or Dropbox, using their Synology device. We also looked at the new DS411 Slim, a 4-bay NAS which uses 2.5” drives in order to give the device a very small size and increase its portability. Check out our video interview. Neoseeker's CES 2012 coverage concludes with our third and fourth reports showcasing booth highlights from both well-known and all-new manufacturers including Zalman, Lian-Li, ROCCAT, SkullCandy, Asus, and Intel. We hope you enjoyed our reports (and the booth babe pics)! After internet issues, staff getting sick, we have finally finished our article. 41 pages for your viewing pleasure, videos are included on some pages, and of course never to be missed the lovely booth babes. AViiQ is known for their laptop stands and portable products. They focus on portability and usability. At CES 2012, AViiQ showed us both of their laptop stands, which place the laptop at a 12 degree ergonomic angle. The Smart Case for the iPad 2 which doesn’t compromise style for performance. A Portable Charging Station with easy cable management for multiple devices, a 4 port USB hub, and a battery pack so you won’t need any outlet. Ready Clips, which are flexible cables that are very portable and easy to carry. Quick Change is a 3-in-1 USB cable that features micro, mini, and an Apple dock port. Mini Surge Protector that easily allows you to get power to 3 AC outlets and 2 USB ports in a portable form factor. Lastly, AViiQ’s Slim Travel Adapter eliminates the need for bulky electrical adapters by folding up into a neat package when not in use. 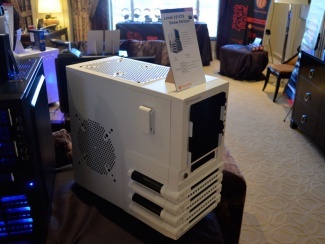 Plextor showed us around their suite at CES 2012 which featured their optical drives and SSD’s. We took a look at the PX-612U, an external DVD writer that has a built in card slot and can connect to a TV thanks to Plextor’s PlexTV software. PlexTV allows you to display anything from the PX-612U onto your TV, whether it is a DVD Movie, or something from the SD card slot, like photos or home videos. On the SSD side, Plextor showed off their M3 Pro Series. A really neat feature about the M3 Pro Series is Plextor’s True Speed technology. True Speed manages the SSD in a manner where performance doesn’t degrade when the drive is in a dirty state. Plextor had a speed test demo running in their suite to prove that True Speed really works, and I can attest True Speed provides a significant boost in read and write speeds on dirty drives.